Is an LCD or LED Monitor Better for Your Eyes? Ergonomic Keyboards – Are They Really That Good? Don’t you just hate having to wake up from a chair with a lot of back pain? And knowing that even after all that pain there is nothing big you can do to resolve it. Many of us spend a lot of money visiting a massage parlor simply because we have been sitting down for long hours. It is actually very costly when every time you suffer from back pain a doctor will go ahead to recommend therapy. The solution might not be therapy after all, but the kind of chair you use. This mesh desk chair may just be a perfect choice for you. The Coavas Ergonomic Office Chair is for those who spend time sitting, whether you work from home or in a busy office. If you are a person who works under a lot of pressure, then you need to find a seat that makes you chair properly. The Coavas Ergonomic Office Chair is one of the best chairs in the market today. Many people are now looking for a more comfortable chair that can give them all the preferences of a chair including comfort. Apart from this, it is also good to look for a chair that is reasonably priced with the demands of life. So what makes the Coavas Ergonomic Office Chair just so special and the best above the rest? Is it the backrest, its armrest, headrest, lumbar support or the adjustable height? The magic is actually in combining all of these. by incorporating the most modern technology in the making of office chairs, this chair has been praised by many. 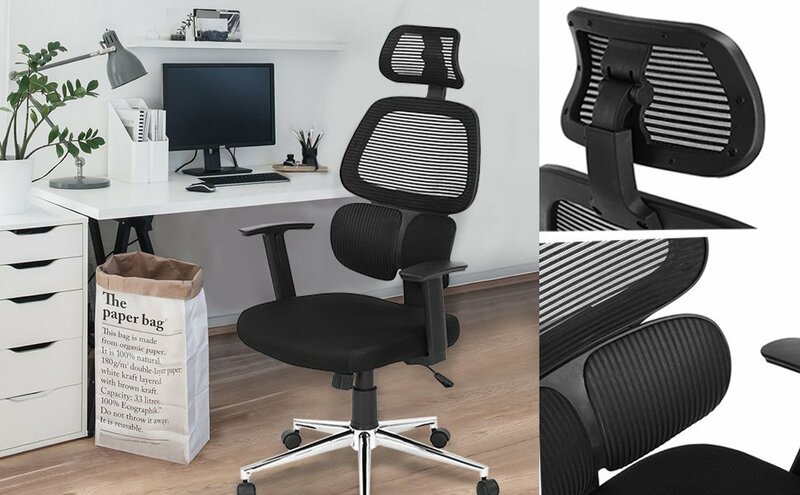 Whether you use it as a home desk chair, executive computer desk chair or for gaming, the following are the some of the reasons you should consider the Coavas Ergonomic Office Chair. The Coavas Ergonomic Office Chair has a high back that provides back support you. can ever find in a chair. It makes you feel relaxed, which is a very comfortable sitting experience while you are working. When you sit on it, you will forget that you had an aching back when you are on this chair. The seat also helps you to correct your body posture while working as it ensures that you stay straight in your chair thus prevents you from feeling tired. The Coavas Ergonomic Office Chair is also equipped with the design of high-quality mesh fabric that is breathable to a user of any size and condition. Some of us get sweaty when we work for long hours. But, with this seat, you can never have to worry about this since the breathable back design enables air to circulate around the seat making you work with comfort all through. The manufactures decided to make use of fabric in their designs as it has the ability to keep the air flowing around you in a more natural manner, thus suppressing the sweat and reducing the back from heating up. This is one mesh desk chair that combines breathability functions with other ergonomic features. If you have a smaller conference room that needs to fit all the board members, do not worry. The Coavas Ergonomic Office Chair will do just fine! 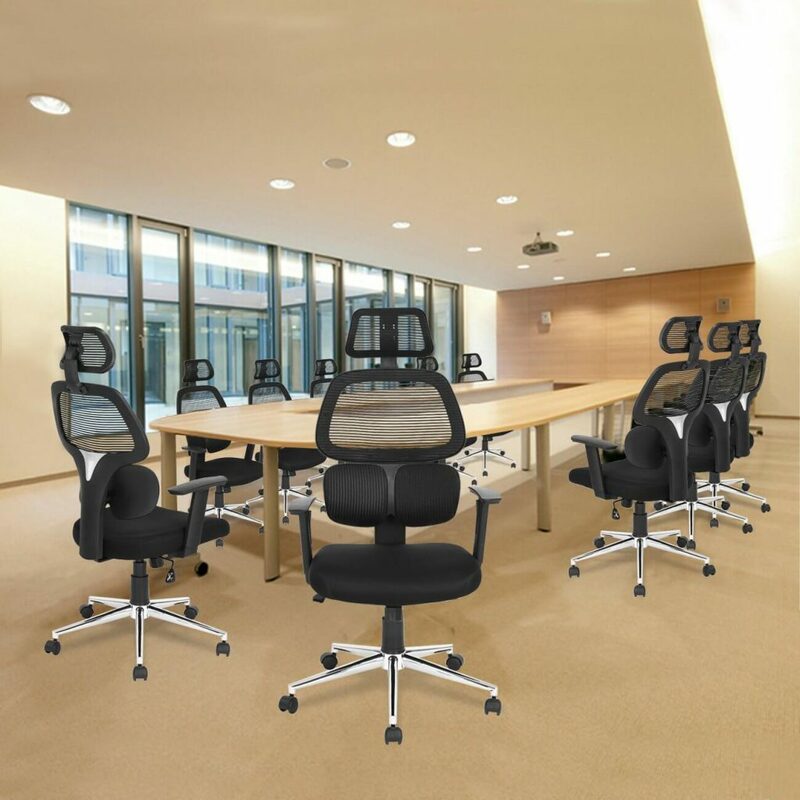 Apart from improving the image of your conference room, the design of the chair allows more space in the conference room thus enabling you to fit the capacity you are looking for. The conference also looks more fashionable and matching seats make every member in the room feel equally important and prestigious. A stable swivel is always fun and good for those who know they are multitasking. With a 360 degrees swivel, you can have a quick conversation with a workmate by swiveling in the next cubical, receive a fax from the other end. The Coavas Ergonomic Office Chair is very stable and has a dual-wheel casters system to match with. This enables you to run smooth and fast on all surfaces without fear of falling. The weight is also evenly distributed on the chair making it very safe even when you are up to 280 LBS. I normally like taking a few moments to rest my neck whenever I work for long hours. In the past, this would mean carrying with me a pillow which I would put on my neck as I take a rest. But this does not have to happen anymore since I discovered the magic of Coavas Ergonomic Office Chair. The chair comes with an adjustable head pillow, which works magic when you feel tired. You only need to adjust it and lean on the headrest. This also protects you from straining your cervical vertebra keeping it in the right place and relaxing your hands in the adjustable armrest. Apart from your head, you are also able to place your arms in a more relieving and comfortable posture while working. The seat is well recommended for people working long hours on the computer or when you spend lots of hour writing. You will not even realize that your arms are strained as the chair improves your work efficiency. So what if you are short or tall? Or that you use the same chair with an office mate or family member in the study. 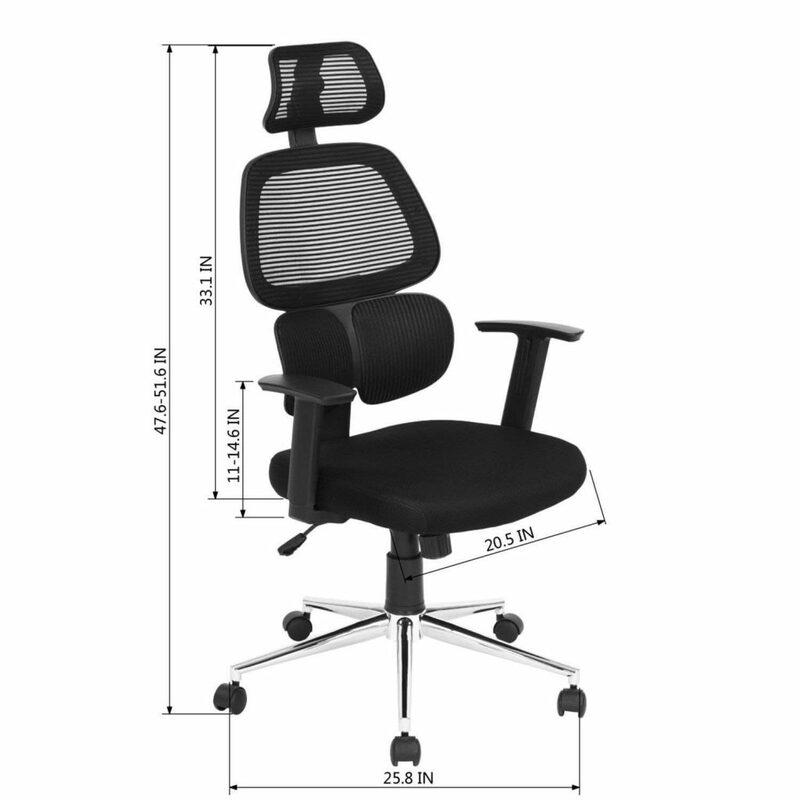 This chair can work magic for you and you will not have to buy a seat for each person that spends time on the study for long hours or work in your one office computer as it comes with an adjustable height function from 41.1 – 45.7 Inch. The Coavas Ergonomic Office Chair is one of the most flexible functional chairs. This is because it is very easy to install with the lettering instructions which makes you save an extra dime from having to call a technician to do it for you. You can also unassembled if faster when moving offices and reassemble by yourself. The Coavas Ergonomic Office Chair also comes in different designs and sizes. There is the Coavas Ergonomic Office Chair customized for those who spend long hours in computers, for those who spend long hours in offices or for the conference room. There are also different sizes for children and the elderly. The chair is well recommended for any kind of office or gaming environment. It comes in different colors and designs giving you several options to choose from. Check the current price on Amazon. Ergonomic Computer Keyboards – Are They Really That Good?